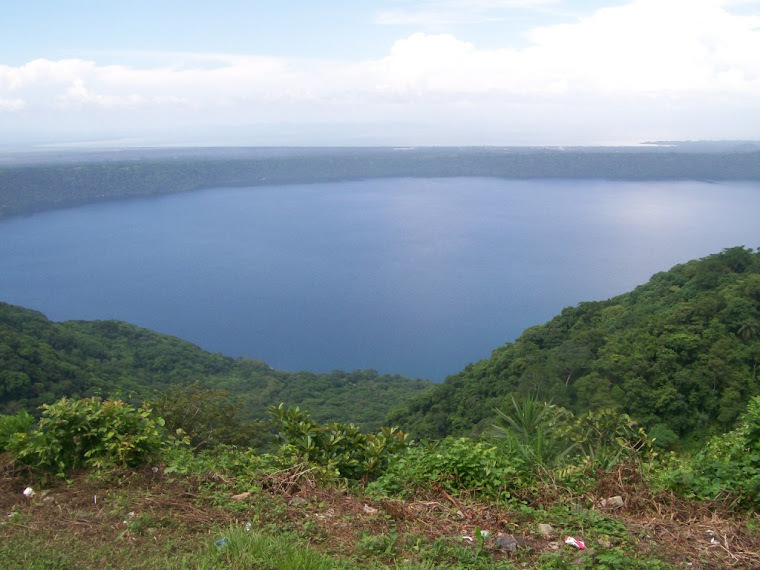 Laguna de Apoyo, Nicaragua: To Ometepe! Estacion Biologica volunteer Florian Schmid recently spent a week participating in a very noble project, to provide better library resources to the children in a rural school in Merida, Ometepe Island. This island consists of two volcanos, Maderas and Concepcion, in near the western shore of Lake Nicaragua, also known as Lake Cocibolca. The inhabitants of Ometepe, the largest island found in a freshwater lake on the entire planet, are distant from "civilization", and they have few resources to learn the things we city folks may take for granted. An environmental activist group from the National Agrarian University organized a series of activities to raise funds to provide books and supplies for these children. They sent a few hundred books to the school, and engaged the local children in several activities. Giselle greets the students of Merida, Ometepe Island. Photo by Florian Schmid. Jessi installs the books in their new shelves in the Merida school library. Photo by Florian Schmid. The group of volunteers held guided discussions with the young people of Merida on a variety of environmental themes. Photo by Florian Schmid. There was time for some dancing! Photo by Florian Scmid. Physical activities were enjoyed as well as intellectual activities. Photo by Florian Schmid. Lots of smiles! Photo by Florian Scmid. Big-screen movies are rare in Ometepe Island, so there was a crowd for this showing! Photo by Florian Schmid. The cruise back to the mainland from Ometepe Island was risky, but all made it home alive, thanks to the concentrated efforts of the captain. Photo by Florian Schmid. All children deserve a happy childhood, filled with opportunities to do and to learn, and books are an essential component. Florian and the group from UNA have made a difference in the childhood of some children in Ometepe. If you would like to support causes such as this, contact us to learn of opportunities for donations and volunteer possibilities, too. Thank you for caring about the children of Nicaragua!